Today I present to you my 2 Little Unicorns Peyote Stitch pattern. I came up with these when my son threw out the challenge to make a unicorn. I think he had the unicorn emoji in mind, but for now these will do. They will soon be glued onto magnets for his collection. In the meantime, these two are going to be dipped in Protecta Clear to stiffen them and then added to some earring findings for my daughter. The first unicorn I attempted, I set aside because it was just too big. The second and third were wonky, first I noticed the eyes were off-center and then it was pointed out that the horn was off-center, as well! I have fixed that and the major differences between these two are the hair... one person said #1 is sassy and I agree with that! I used primary colors, first, because I liked the brightness and contrast of the colors and second because there aren't enough traditional unicorn colors available in the 15/0 Delica size. I keep hoping they will expand the color line! I have yet to bead these up in the 11/0 size, but I am sure I will get to it one of these days... once I have an lull in patterns that need beading up. 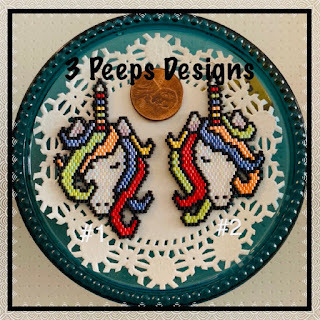 In this PDF, I include the picture of the actual beaded unicorns, the color chart of Delicas used, the color chart, and then a blank chart of each unicorn. I do this so that you can color it in the colors you want and this will give you a better idea of whether you like those color choices. Send me an email so that I can email the PDF to you... the comments form on my blog DOES NOT give me your email address... without your email address, I cannot send it. The contact form is located at the top of the page. Now, if you would like to leave a comment on my blog, well, that is just gravy and I would certainly appreciate it... Feel free to comment on whether you like the pattern or not or if you have a blog I should check out, or how you use the Emojis. Directions for peyote stitch are not included... there are plenty of sources online for that by people who are better teachers than I. The Word pattern is not included because it is a relatively simple project and the color chart should be more than enough. *** If you use my pattern, please be kind and give me the credit as the designer, ie beaded by Dana Shmoe and Designed by 3 Peeps Designs. I don't mind if you sell your completed project for bead money, but I want design credit. Why do I want design credit? Well, I do still sell some of my patterns and I use the money to buy beads. It isn't a business, it is for fun ie funding my beading habit. Seeing my designs in your shop (or anywhere else) without the design credit takes all of the fun away... and I will take steps to have the photo removed.. 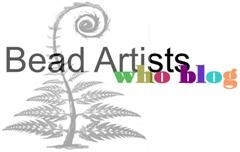 This is fun, I'm trying to be charitable, and I design a lot more than I have a chance to bead... and I know there are others who don't like to design, but do enjoy beading. As soon as Free Pattern Friday stops being fun, I will stop doing it. *** And just because I am offering my patterns for free does not mean you can just pass it around to your friends. Please, have them come to my blog and comment, etc in order to get their own copy. * I know most of you don't need to be reminded of beady etiquette, but some of you do and I'm just trying to keep it real. I apologize for not having some sort of automatic download of the pattern on the blog, but I don't know how to do it and I don't want to learn right now. I like the interaction that commenting and then sending an email requires. If you're on Facebook, send me a friend request! I'm trying to fill my FB feed up with beadwork rather than anything too serious.